This luxury beach home design showcases amazing ocean views from the master bedroom, the living room with its attached dining area, and open concept kitchen. 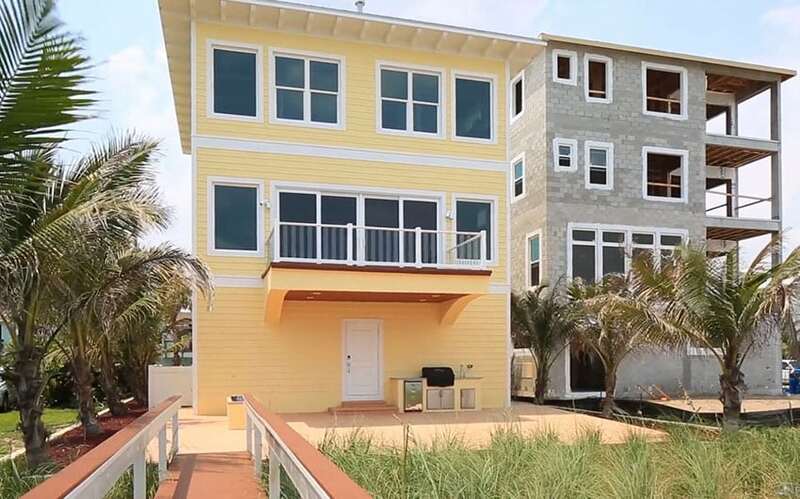 The beach home offers 3 bedrooms and 3 bathrooms with floor to ceiling windows. The private backyard deck is the perfect place to enjoy this fantastic ocean front location and take in the expansive views. From the back patio visitors are steps to the sand and the inviting crystal clear blue waters. 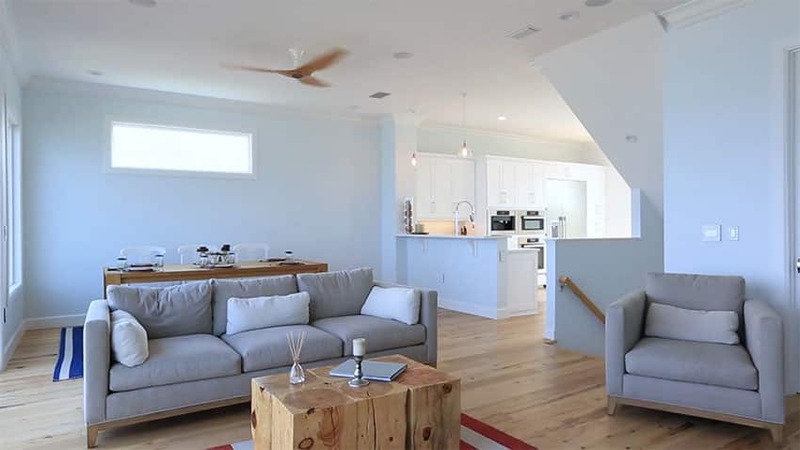 Inside the beach home you’ll find high end finishes, detailed moldings and decor. The open concept kitchen is equipped with upscale Miele appliances, white flat panel cabinetry, and beautiful white quartz counter tops. From the kitchen one can appreciate the stunning water views and enjoy the open concept space that flows in to the living area. The home features lovely hickory hardwood floors throughout, with large picture windows that open to a glass railed terrace. 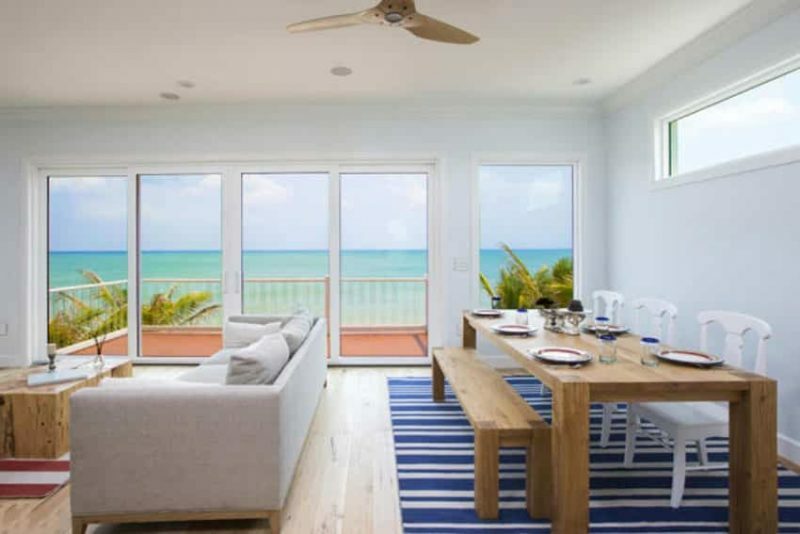 The oceanview living room showcases the million-dollar views and the decor is perfectly suite for the beach house style. The large bright windows provide tons of natural light and the light hickory wood flooring definitely helps keep the room feeling refreshing. The open concept living space opens to a small dining area next to the adjoining kitchen. 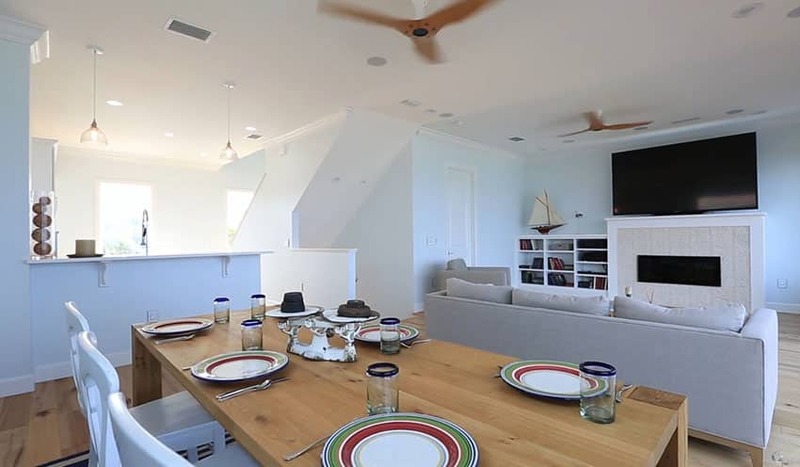 Guests can enjoy dining while watching the waves crash in and taking in the amazing sights of oceanfront living from this luxury home. 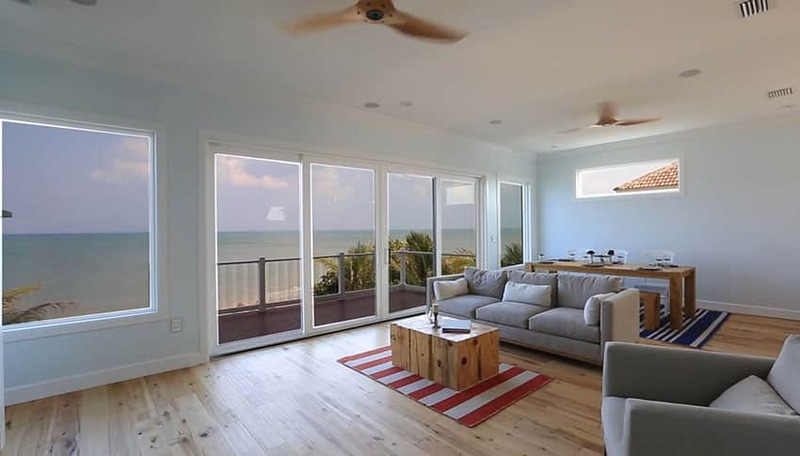 The large glass doors open to a railed terrace to provide additional opportunities to take in the sights and sounds of the ocean front lifestyle. The neutral-toned decor is perfectly suited for a variety of furnishings and design styles. Another view of the transitional living space with comfortable furniture pieces and rustic wood coffee table and dining table. One can not help but feel the beach vibe in the room’s decor and color palette. From the room’s ding table you can see the stylish gas fireplace with wall mounted television. The dining area opens to the chef’s kitchen with its quartz topped breakfast bar counters. 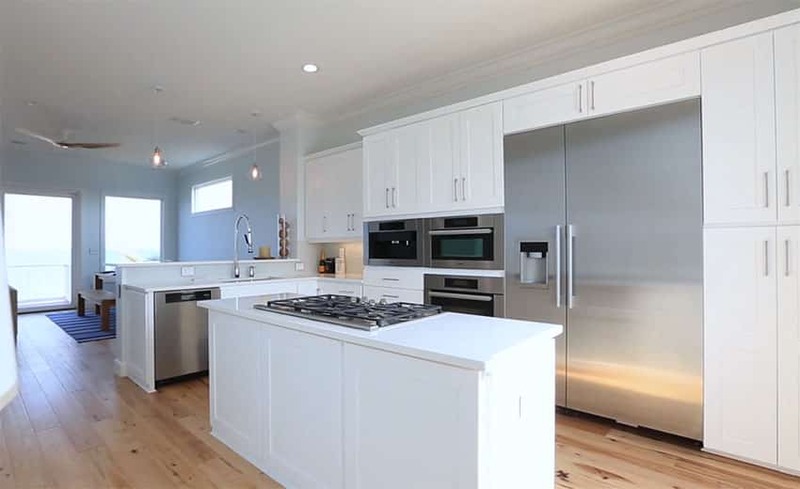 The elegant white kitchen is well designed and constructed with gorgeous white flat panel cabinetry, white quartz counters, Miele stainless steel appliances and an island with a built in stovetop. 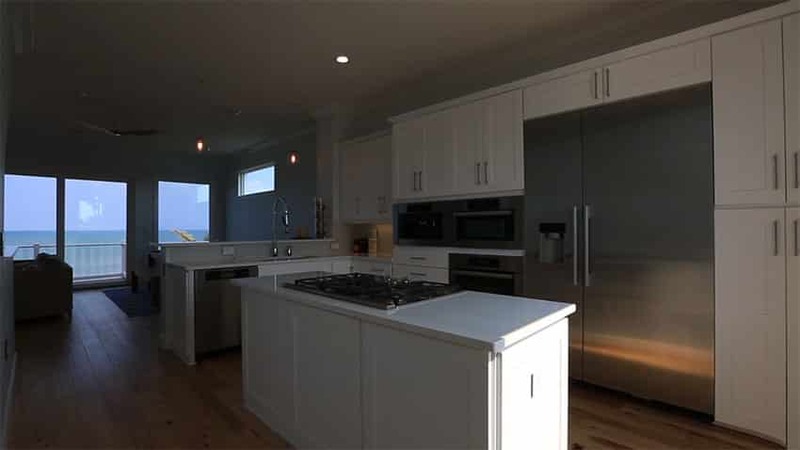 From this angle of the kitchen you can see a different perspective of the rectangular kitchen island and the blue waters of the ocean. This pictures shows a view of the kitchen area in the evening with its dim adjustable recessed and pendant lighting. The luxurious ocean view master suite continues the feeling of oceanfront living with its modern faux coral accent wall, detailed molding and decorative white four corner bed. The light hickory floors and multiple windows keeps things light and bright. A view of the master suite at nightfall showcases the peaceful ambiance of the room. 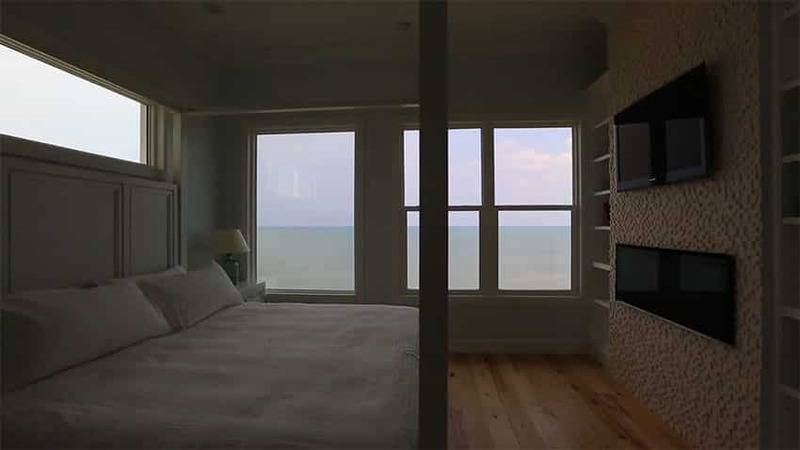 Imagine waking up in this master retreat to the sound of the waves and seeing the ocean from your bed. 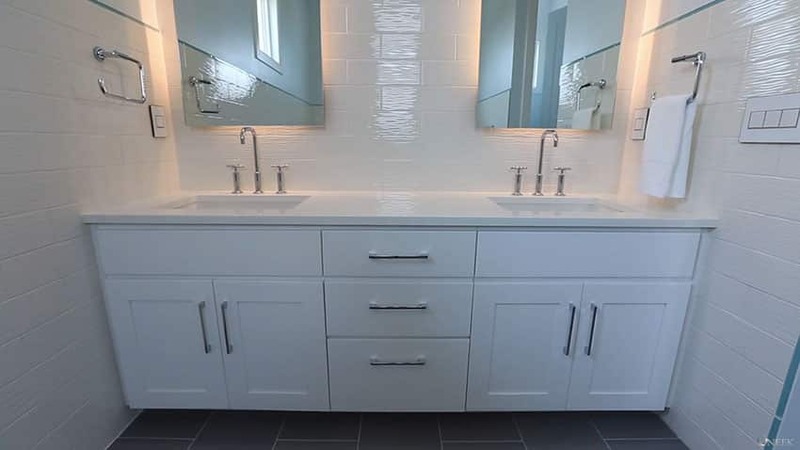 Inside the master bathroom resides bright white brick tiles with a white cabinet vanity and dual his and her sinks. Chrome finishes and backlit mirrors give the room a warm glow. 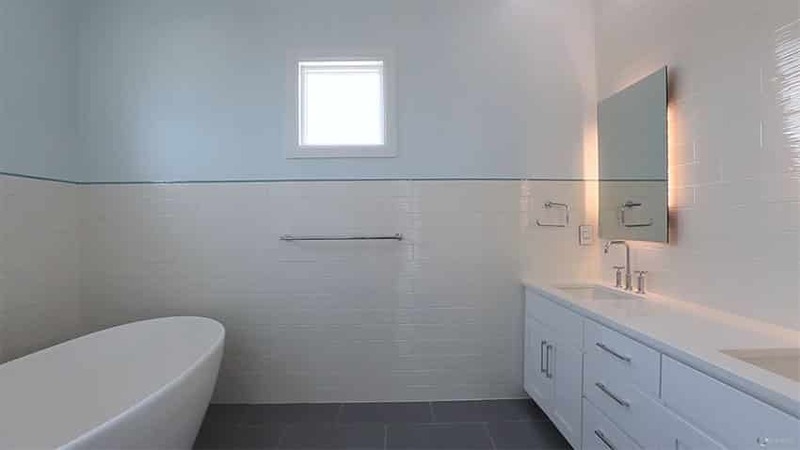 The bathroom’s elegant tile work surrounds the large soaking bathtub and contrasts well against the dark mocha color of the floor tiles and the powder blue wall paint. 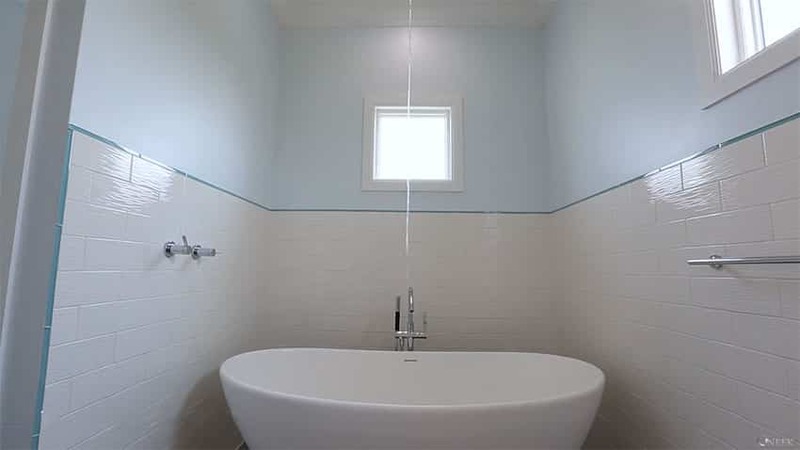 A front view of the contemporary bathtub with its ceiling mounted rainhead water feature. In this image you’ll find the guest bathroom. 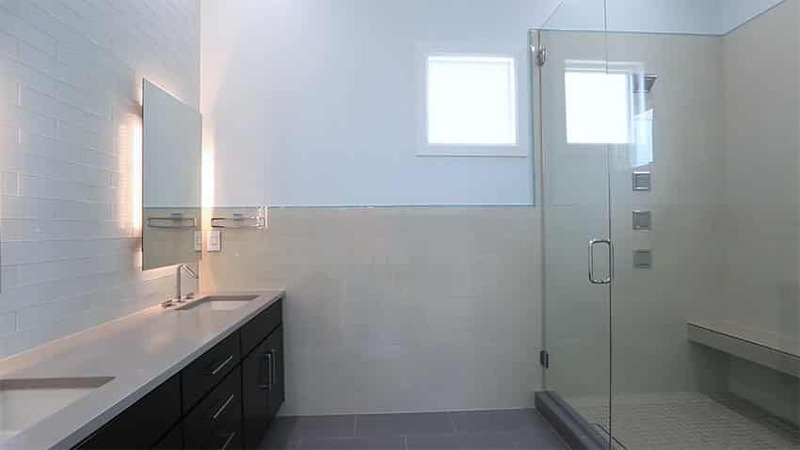 Across from the dual sink dark wood cabinet vanity you’ll find a large frameless glass wall shower with a relaxing 12 spout shower system with digital control. 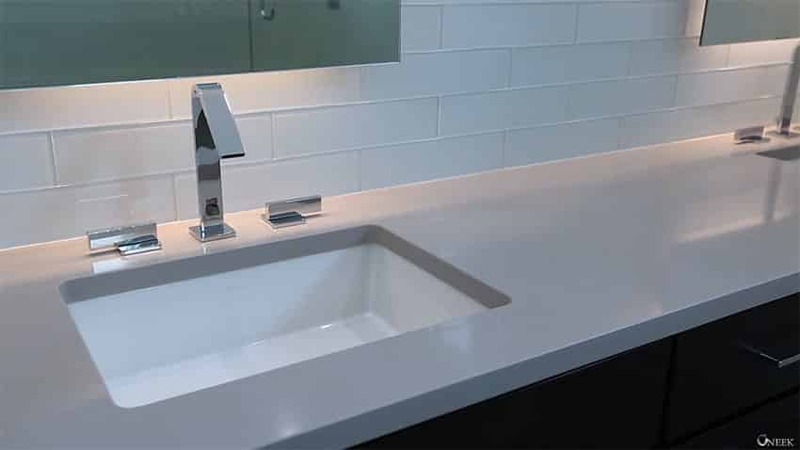 A closeup view of the contemporary bathroom’s sinks and finishes. 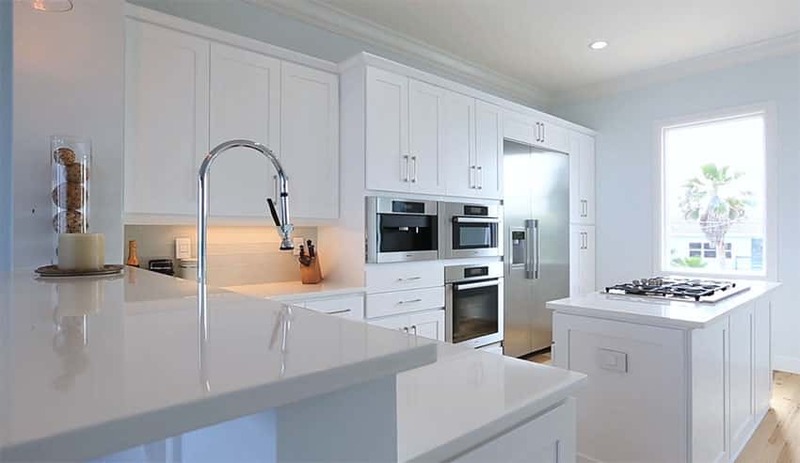 Gray quartz countertops with white subway tile backsplash are an attractive combination. This bedroom is setup as a home office with modern desk and shelving unit. Large picture windows allow in plenty of natural light to help increase productivity and well being. 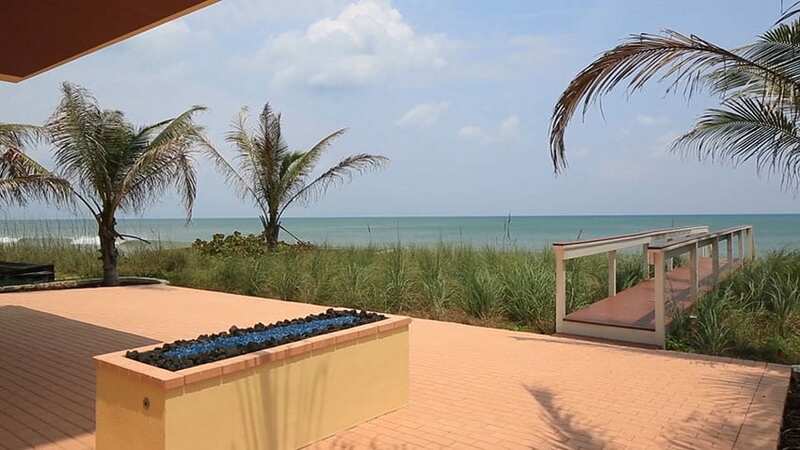 Outside the beach house one can find a brick paver patio with outstanding ocean views, a modern firepit and tropical palm trees. The beach patio also offers a small outdoor kitchen area equipped with a grill, small refrigerator, cabinet storage, and counter space. 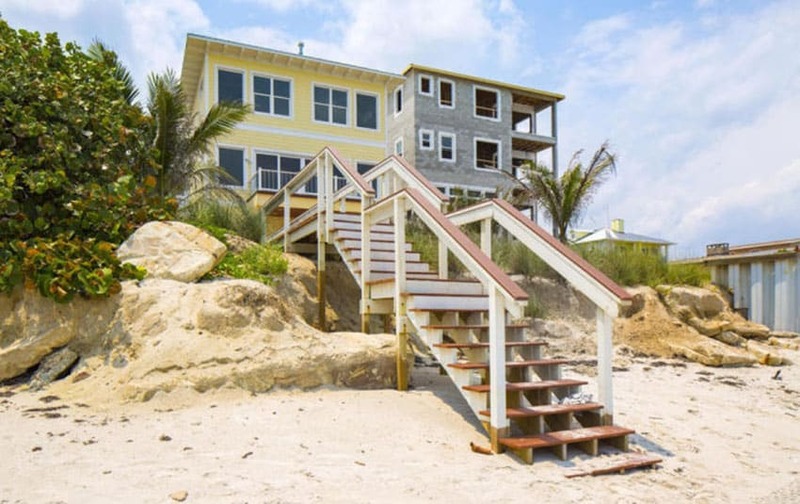 A private wood railed walkway provides immediate beach access. 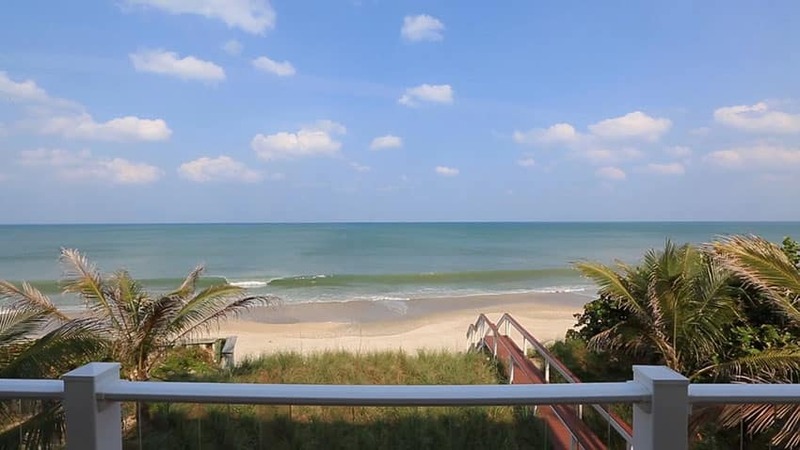 From the backyard of the beach house one can see the second story balcony and attractive exterior of the home. 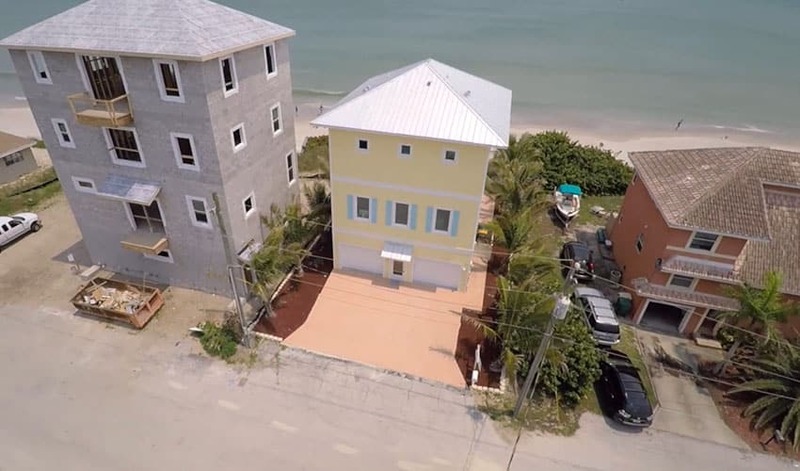 An aerial view of the beach house and neighboring properties. 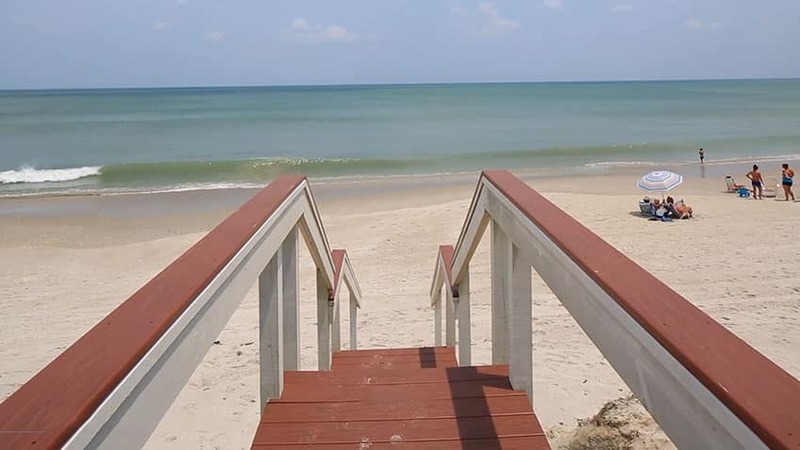 A private wood walkway leads to the inviting sandy beach that’s the perfect place for a day of sunbathing and fun in the water. 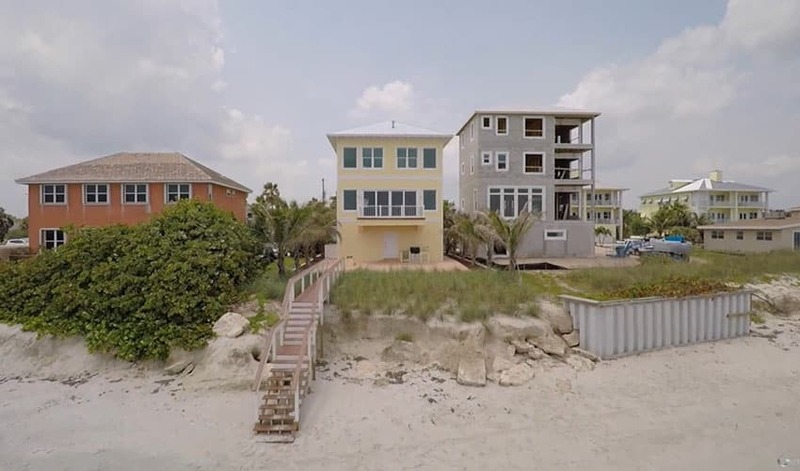 The beach home features high quality construction to withstand adverse weather conditions. With 25 foot pylons, high impact windows, and a breakaway walls on the garage the home was constructed with safety and insurance premiums in mind. 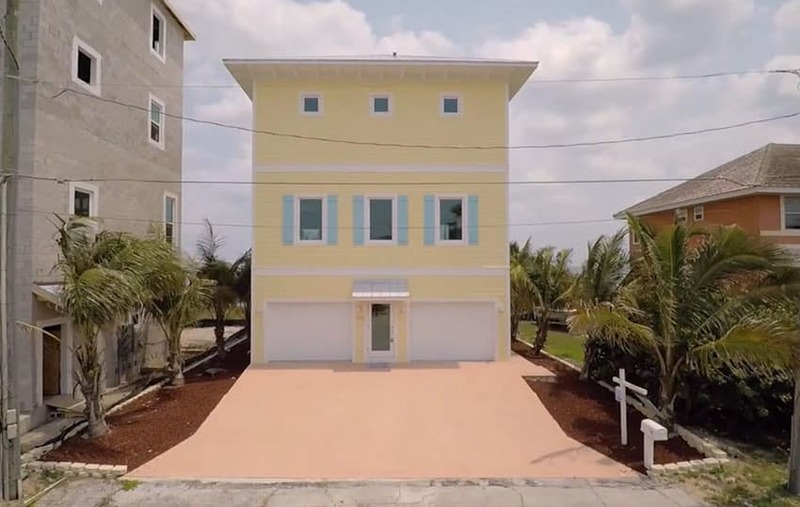 The front view of the beach house is bright and cheery with its yellow painted exterior with white trim and blue accents around the windows. It has a two car lower level garage and low maintenance landscaping with tropical palm trees and dyed concrete driveway. The second story deck terrace is a great place to sit in lounge chairs and relax in the shade while drinking your favorite beverage. 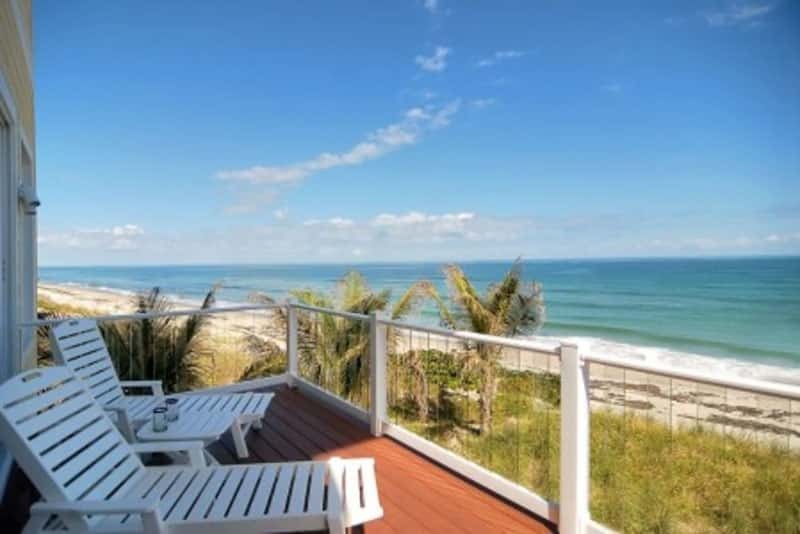 Paradise awaits at this beautiful beach home and is the ideal spot to enjoy stunning views of the oceanfront sunrise.